I don’t suffer from any sort of anxiety disorder but I am quite experienced with garden variety anxiousness. * So that means I get stressed out while to manage my work, or when I am trying to figure out what order to do my work in. I’m sure lots of you have the same kind of thing going on. While anxiety makes my thoughts hop from topic to topic, my main physical symptom is tightness in my neck, shoulders and upper back. Sometimes I don’t even realize I feel anxious until my neck gets cranky with me, and then I take the opportunity to corral my racing thoughts and bring myself some ease. This is what happens when I try to demonstrate a stretch while smirking and then accidentally close my eyes as I snap the photo. Goofiness abounds. I wouldn’t say that anxiety *causes* me neck and shoulder tension but they are definitely related. I discovered a few years ago that the relationship goes both ways. If I do too much writing, or overdo my upper body workouts, or if I walk too long in the wind,** my neck and shoulders get tight. Once those muscles get themselves in a twist, my brain goes problem-solving mode and tries to figure out what I am anxious about. My breathing gets shallower, I draw my shoulders up closer to my ears, and I keep waiting for the proverbial other shoe to drop. The thing is, there wasn’t even a first shoe, let alone an ‘other’ one. I wasn’t anxious in the first place, I just had tight shoulders. But my brain, my ever-so-helpful brain, knows what that tension signifies and reacts by generating anxious thoughts. Okay, it’s more frustrating than delightful, but at least I have started to recognize when it happens. 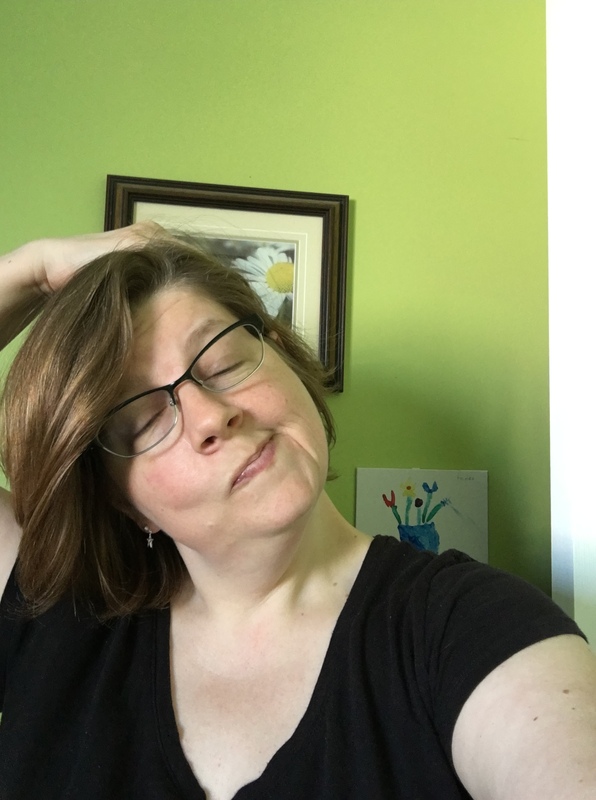 Once I know what’s going on, I stretch, I do a little exercise, I roll a lacrosse ball around on my shoulders and neck (based on my chiropractor’s advice – thanks, Ken!) and eventually both the muscle tension and the resultant anxiety eases. This whole scenario happened to me this past Sunday. I woke up with neck, shoulders and upper back all pulled taut. I had weird nightmares all Saturday night so I suspect that I was hunching my shoulders in my sleep. I spent a good chunk of Sunday morning feeling pretty awful – my brain was bouncing from side to side in my skull and it was hard to breathe – and I couldn’t figure out what to do with myself. I meditated for a little while which helped with my racing thoughts but not with my shoulders, and then I hit on the idea of doing some yoga. It was exactly what I needed. Not only did it have the sort of stretching that I needed to do, it kept me sitting still long enough for my brain to rest a bit. My next step is to work on some preventative habits that help keep my neck from getting so tight in the first place. Do you have that cause then effect and effect then cause thing going on too? How does it happen for you? What do you do to help yourself out of that loop? *I feel like this is pretty common with people with ADD. When you have trouble measuring time and your executive function is not always on call, the risk of messing something up or forgetting something important is pretty high. **Apparently, I hunch my shoulders when walking in the wind. This is a serious hazard in NL where it is windy ALL THE TIME.